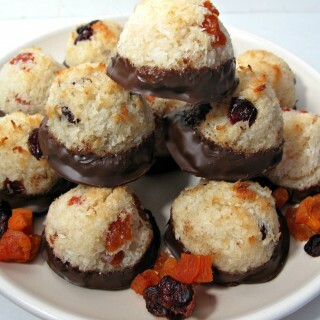 I made apricot and cranberry macaroons for my mother. She has always been the coconut lover in our family and macaroons are definitely for coconut lovers. 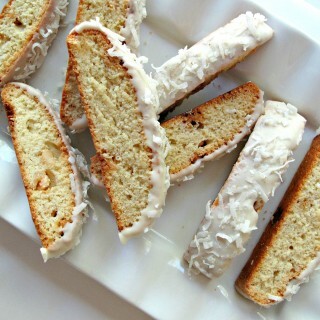 They are the ultimate coconut cookie; slight crispness on the outside giving way to moist, chewy coconut inside. 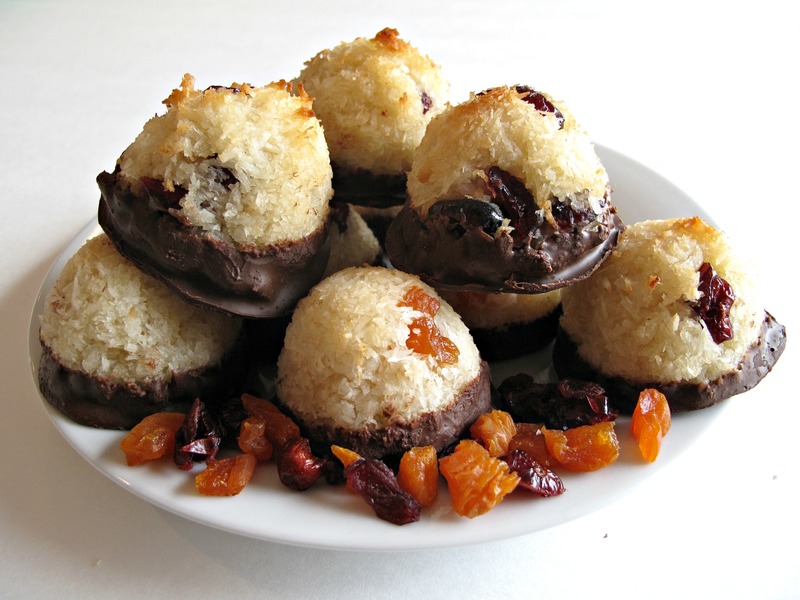 These particular balls of macaroon deliciousness are speckled with chopped dried apricot and cranberries, and dipped in dark chocolate. My mother doesn’t bake these days and she doesn’t have access to bakeries that make macaroons. Her only option has been to buy the canned macaroons sold in supermarkets during Passover. If you have never been desperate enough to by canned macaroons, I suggest you keep it that way. They are overly sweet and artificially flavored, with a chewy gluey texture; nothing like a homemade macaroon. Most macaroon recipes are flour and grain free, making them gluten free and kosher for Passover. The biggest difference in the recipes I have tried, is whether or not the recipe uses sweetened condensed milk. 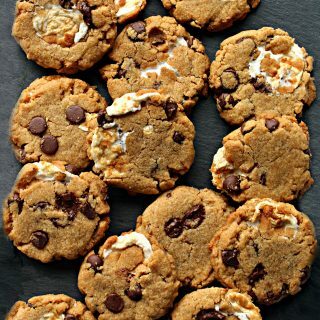 There is no question that using condensed milk results in a consistently moist and pleasantly chewy cookie, but they also tend to be cloyingly sweet. Unfortunately, most recipes without condensed milk are often dry and crumbly. I searched for a recipe for moist, chewy, macaroons with coconut flavor that shined. I found what I was looking for. 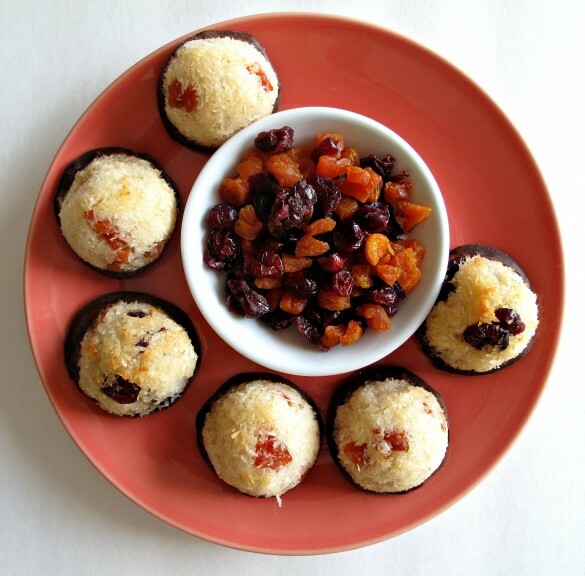 These apricot and cranberry macaroons are adapted from a recipe by Tori Avey. The unique ingredient in her recipe is starch; potato starch for Passover use or corn starch otherwise. It works as a binding ingredient and keeps the macaroons chewy. I added another unique ingredient, Lyle’s Golden Syrup, which adds moisture and a slight caramel flavor accent. The macaroon filled care package should arrive at my mother’s door tomorrow. It’s a surprise. 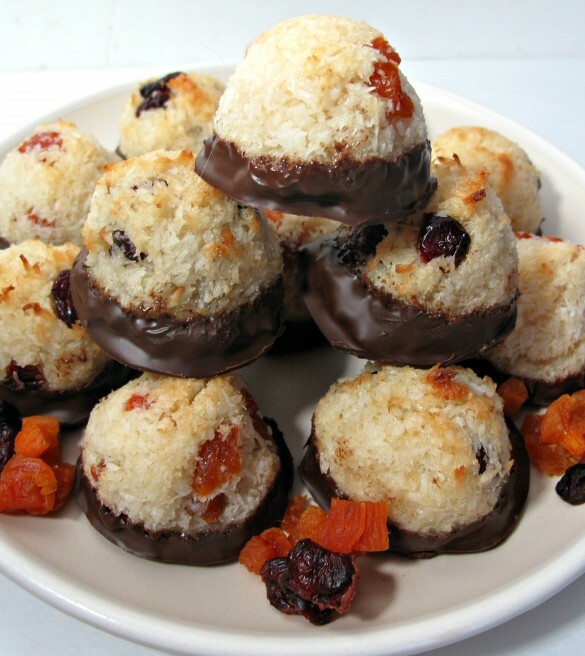 I am confident that these Apricot and Cranberry Macaroons will satisfy my mother’s coconut cravings and keep her away from the supermarket after-Passover clearance sale on the macaroons in cans. 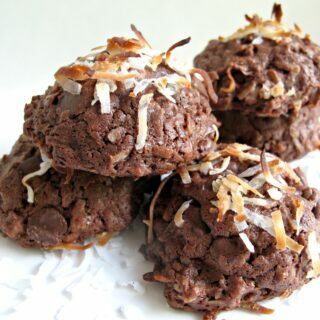 Macaroons are fast and easy to make any time the tropical flavor of coconut beckons. 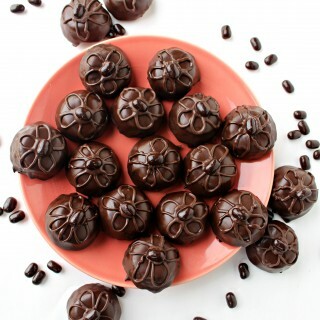 For eating at home or shipping in cool weather, I suggest dipping the bottoms in chocolate. 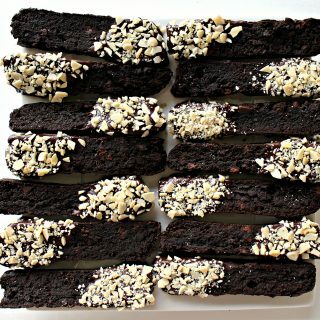 The bitter-sweetness of dark chocolate pairs beautifully with the sweetness of the cookie. In a large bowl, mix together coconut, starch, sugar and salt. In a small bowl, whisk egg whites and vanilla until foamy (about 2 minutes). Add the egg white mixture to the coconut mixture and stir to fully combine. Stir in the apricot and/or cranberry bits. Then allow to sit for 20-30 minutes to rehydrate the coconut. Preheat oven to 325° F. Line 2 baking sheets with parchment paper. After the 20-30 minute rehydrating, stir the batter. Scoop 2 tablespoon (medium scoop) amounts of batter onto the prepared baking sheet about 1” apart. 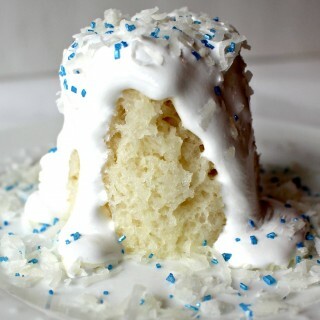 If desired, use wet fingers to gently shape the coconut mounds. Bake for 15-17 minutes, just until the bottom edges turn golden. Cool completely on the baking sheet. To chocolate coat the bottoms of the macaroons: In a small bowl, melt the chocolate pieces in the microwave for 1 minute at 50% power. 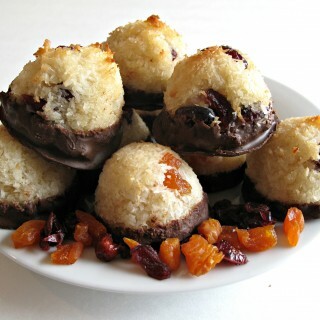 Dip the bottoms of the macaroons into the melted chocolate and place on a wax paper lined baking sheet to set. Refrigerating the cookies will speed the setting process. Do not wrap until the chocolate is completely set. Store macaroons at room temperature in an airtight container for up to 5 days. Refrigerated macaroons stay fresh for at least one week. Once the chocolate is completely set, double wrap individual macaroons in plastic wrap, then stack in columns in a freezer weight ziplock bag. 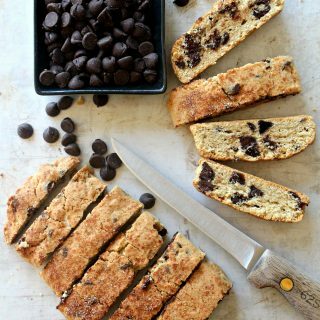 Here are more ideas to quench your coconut cravings! Click on the photo for the recipe. I have yet to make macaroons. that has just got to change!! They look pretty easy and I have most of the ingredients. I’m definitely going to have to make these for my husband. He would love them! These are definitely the fanciest macaroons I have seen! Thanks, Kara! The macaroons are probably the easiest cookies I have ever made, but we can keep that a secret when you make them for your husband! 😉 I hope he loves them! I’m enjoying your blog. The macaroons look lovely. I grew up in British West Africa where we bought and kept “Tate and Lyle’s Golden Syrup” on hand. I loved it hardened on our homemade Ice Cream. Ahhhh, such memories. Do you live in the States? If so, where do you get the syrup? Thanks, Kathryn! 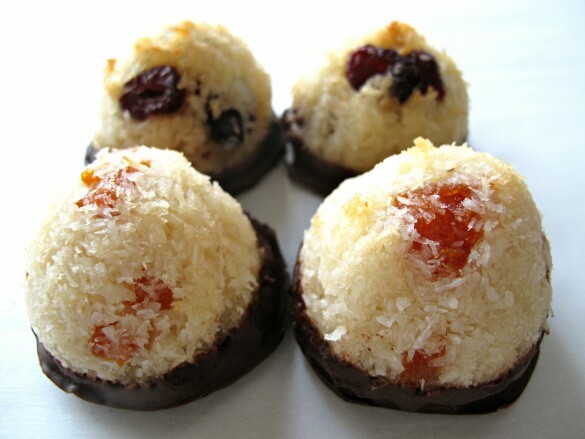 Macaroons are really a dream cookie for coconut lovers. They can be made plain or with the add-ins of your choice. I am thinking mini chocolate chips next time? 🙂 I hope your little ones love them! Looks like you found a winner Wendy. Scott is macaroon crazy – he would LOVE these! How did your mom react, Wendy?! Such a lovely thing to make these for your mom. I’m sure she will appreciate the thought, the effort, and most definitely the taste. Looks sensational! Thanks, Monica! The cookies haven’t arrived yet. Thank you US Postal Service! I thought 2-day delivery meant that they would be delivered in 2 days. Apparently, not. Once the box is delivered to her building, it is unlikely she will get them until Monday. Lesson learned. Its the thought that counts. These look so good. I am in love with coconut! Also, I might just add that you take amazing photos! Yummmm. These look fabulous. 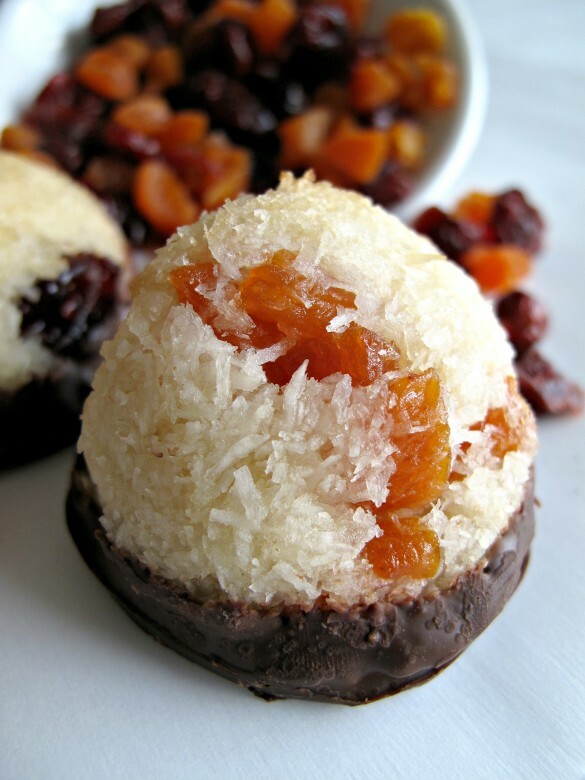 How can you go wrong with coconut, chocolate and apricots. Thanks for sharing !!! I used to despise coconut when I was younger. Nowadays, I can’t get enough of it! Living a gluten-free lifestyle, I am always on the look out for scrumptious new dessert recipes, and ones with coconut are even better! I will save this recipe and try it out! Thanks for sharing! I am with you on the coconut, J! I never liked it as a child, but really enjoy it as an adult. 🙂 Because my daughter is gluten free, both of the Passover recipes I posted this year were gluten free. This one uses no flour, and the whoopie pies used coconut flour. Both were huge successes at our house and no one could tell that the cookies were gluten free! These look wonderful Wendy. So pretty and the chocolate dipped bottoms really seal the deal for me. Love the fruit int he middle too. Have a wonderful week! Thanks, Tricia! I love chocolate dipped fruit, so the chocolate dipping was not optional for me! 🙂 Wishing you a great week ahead! These are the most beautiful macaroons I ever set eyes on! So perfect Wendy. The cranberries and apricots sound like a delicious addition. I tried to make them once before and they were inedible. I’ll have to keep this in mind for next time – my entire family loves coconut. I can’t even remember the last time I made macaroons at home! I love that you used apricots! I feel like they are so underused! I’ve really been into sweets that aren’t overly sweet lately – so I love that these don’t use the sweetened condensed milk! Oh boy do this look good! I feel like I could reach in and pick one right up and wish it were true! 🙂 Thanks for sharing with us on Throwback Thursday! Thank you, Christine! I love surprising my mom with homemade baking. Her enjoyment of whatever I bake makes me smile. ?Thank you also for hosting Friday Favorites! 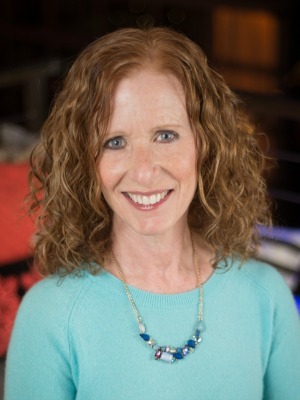 Thank you, Gloria, for the feature! Thank you,also, for hosting Friday Favorites Linky Party! Yum. Believe it or not, out of all the desserts out there, I have never tried making my own macaroons. This recipe may have changed my mind though! 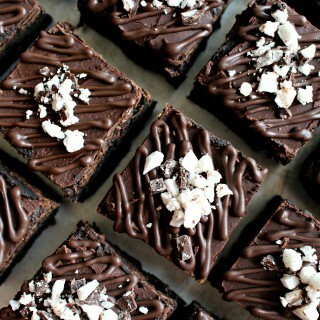 I wish I could sample straight from the photo, they look that good! Thanks for sharing! Thanks, Julie! I do believe it about never having made macaroons, because I hadn’t either before I started experimenting with the pile of macaroon recipes that resulted in this one. Give them a try. They are amazingly easy, quick, and chewy good! Pinning and scheduling to share on the Hearth and Soul Facebook page, Wendy. These macaroons look so pretty and sound so delicious. Love how they are dipped in chocolate too. What a lovely gift for your mother! Thank you for being a part of Hearth and Soul. These macaroons look so fluffy and delightful. They definitely look too yummy to be gluten free. Thanks for sharing with us at the Family Joy link party! Oh, my! These look amazing. Mouthwatering good! Pinned and sharing. Thank you for joining us at Family Joy Blog Link-Up Party. I hope you will join our next party starting Sunday at noon EST.